Happy New Year! I'm back. Let's not make a big deal about it. Things have settled down some at work and I am making it my goal for 2017 to start posting regularly again. I have been cooking all this time but I have been sticking to tried and true old favorite comfort foods, and with notable exceptions most of my forays into the world of experimentation have not been overly successful. Edible, but not successful. I did learn a valuable lesson, though - sometimes you need to just go back to those old favorites and recipes you can make with your eyes closed so you can continue to nourish yourself when you have neither the time nor the inclination to spend your energies in the kitchen. In the beginning of this period I would continue to buy new foods with little plan as to how I was going to use them, but by the time I got them into my kitchen I had no idea what I wanted to do with them and less inclination to try to figure out something. Once I accepted that this was not going to be a creative period for me things got easier and I did not end up eating ice cream and cheesy popcorn for dinner more than just a few times. And that is no small miracle, let me tell you. But an unplanned rearranging of my recipe files accompanied by a less crazy life have inspired me to get creative in the kitchen again and to share my adventures. And the sheer volume of recipes that I have collected over the years that I want to try has given me a shocking awareness of my mortality. Ignoring my initial intimidation at the thought of how much there is, I have decided that I will make at least one new recipe a week. So I went through my recipes yet again, this time pulling out all of those that seem realistic for me to make now and leaving all of those fancy, intimidating, pull-out-all-the-stops-to-impress-your-company dishes for those times when I am truly feeling courageous and creative and have the time to step out on that culinary limb. I found a dead easy recipe for my first effort. I am fortunate that my manager at work enjoys food and cooking as much as I do and she came into my office the week before Christmas with Lidia Bastianich's Lidia's Commonsense Italian Cooking and offered to lend it to me for a few days. I eagerly took it home and looked through it over the weekend and found some more new recipes to try. My workday breakfasts usually consist of oatmeal or hard boiled eggs and toast that I take in to work with me so I like to splurge a little on the weekends. But I don't always want to take the time involved to make a frittata or omelet. So when I saw this recipe for Oregano and Eggs it looked like the perfect compromise between little effort and big reward. And it was. This recipe takes no time to prepare and very little effort. And given that the eggs are cooked in a covered pan I was surprised that they did not get that filmy coating over the yolks that usually happens when I cook eggs this way. I am thinking maybe it's because the eggs are cracked into a cold pan so there is time for the whites to settle around the yolks before they harden. Whatever the reason, I am hooked. The oregano and cheese lend a beautiful, subtle flavor to the eggs that could easily be replaced with different herbs and cheeses for more variety. And you can just as easily cook two eggs as you could a dozen. This is a perfect dish for company brunch when you need something fast and easy that is impressive and delicious. This is about as close to set-it-and-forget-it as you can get with an egg dish. 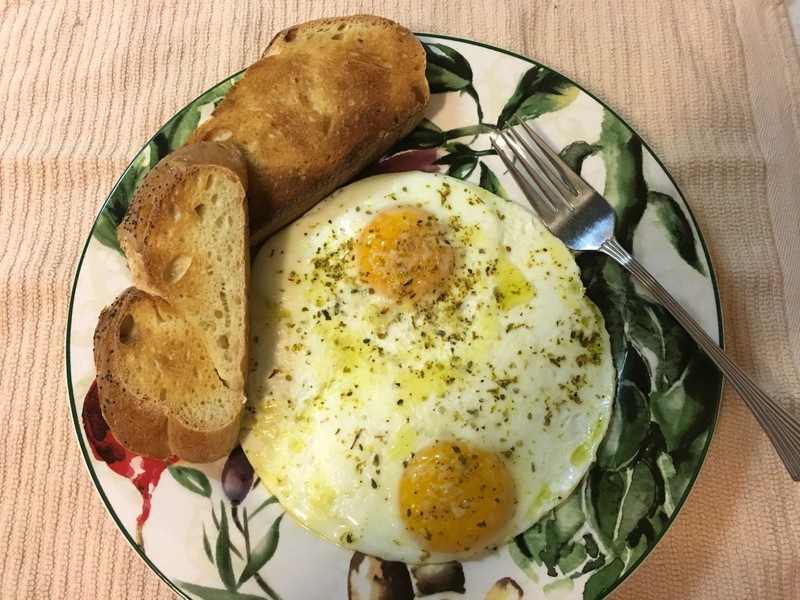 I only used a scant tablespoon of olive oil and a smaller skillet when I cooked my two eggs. All you really need is enough oil to coat the bottom of the skillet. Pour the olive oil into a cool large 12-inch nonstick skillet and swirl it around to create a film over the surface. Gently break the eggs into the pan and sprinkle with the salt, pepper, oregano and cheese. Cover the skillet and set it over a medium-low flame. Cook for 7 to 8 minutes, until the whites are set and the yolks are the consistency that you want. "And the sheer volume of recipes that I have collected over the years that I want to try has given me a shocking awareness of my mortality." I love this line. Me too!! Hi there - it's nice to see you. You can see how successful I have been at posting regularly. I hope to get back to it again soon. The saddest part is that I have collected even more recipes since I wrote that. And my "one new recipe a week" has kind of fallen by the wayside as well. Ah well, life!